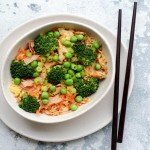 15 Minute Fried Rice & It's Seriously Good! Fried rice on the table in less than 15 minutes, I am not even kidding! 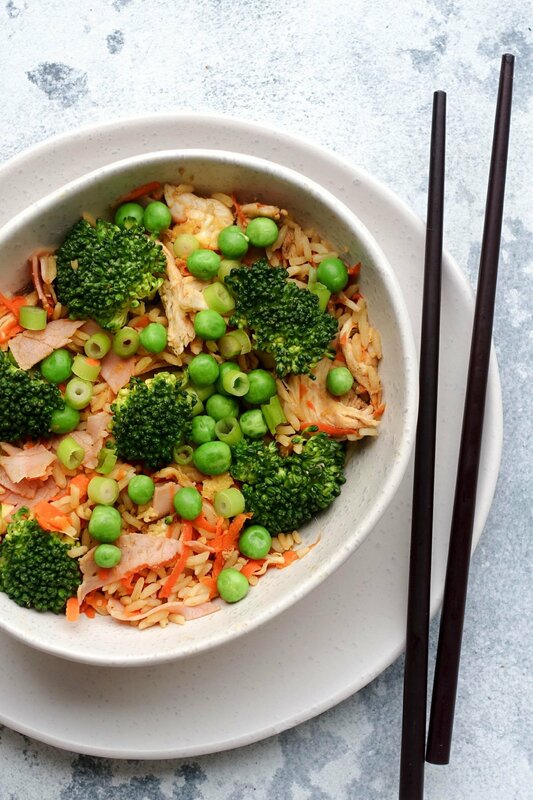 This 15 Minute Fried Rice is a healthy and delicious take on the Chinese classic. I promise, you will never order take out again! A quick and healthy take on the Chinese classic, in just 15 minutes. Cook the rice according to packet directions. Meanwhile shred the chicken, grate the carrot, break the broccoli into florets, slice the ham and spring onion and whisk the egg. Next heat a wok or large frying pan over medium heat with 1 teaspoon of sesame oil. Add the whisked egg, and when it begins to set use of spatula to break it up. Set the egg aside when cooked. Add the remaining sesame oil and soy sauce/tamari and stir through. Remove from heat and top with sliced spring onions. The serving size is generous, so if your cooking for a little one as well, there will probably be plenty to go around. For bigger families, just double the ingredients. Have a pea hater at home? You can mix and match the veggies to suit fussy eaters or use up whatever you have in the fridge. If you make my 15 Minute Chicken Fried Rice remember to share it with me on Instagram. I love seeing and sharing your creations. Plus, one lucky reader each month will win their own You Totally Got This grocery bag. You can find me @youtotallygotthis – don’t forget to set your account to public and use the hashtag #youtotallygotthis so I can find you. 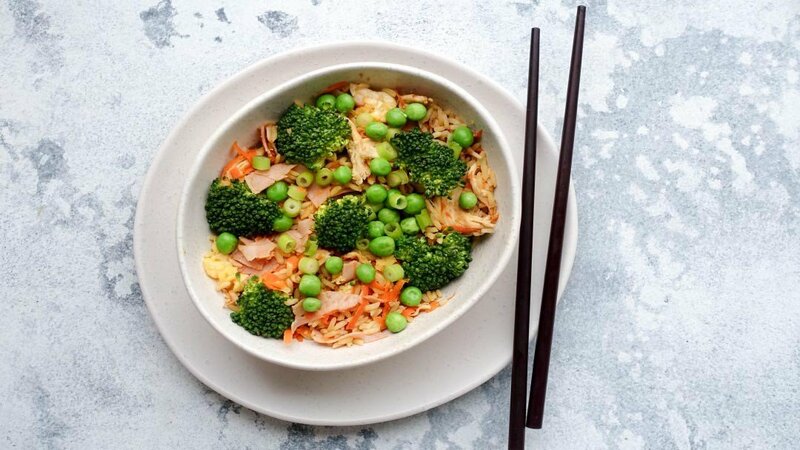 P.S Want a whole weeks worth of dinners just like this Chicken Fried Rice? Grab your FREE quick and easy weeknight dinner plan right here.